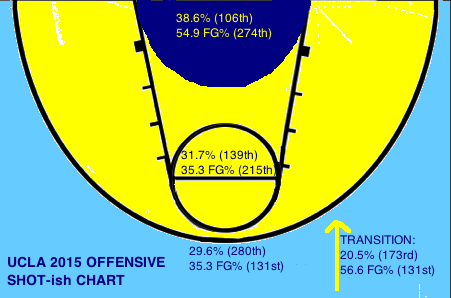 Nearly 40% of opponents’ shots come from beyond the arc which is a gamble we’ve previously discussed regarding UCLA’s zone. Basically you’re either jacking a three or getting a shot at the rim against this team. 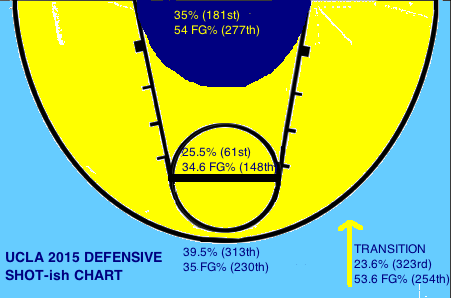 Fortunately, the Bruins protect the rim effectively enough (that rim FG% is pretty low). And when I note this defense’s inactivity, it’s perhaps a purveyor of transition: 23.6% of offense against UCLA is coming on the break. This is a tough factor considering UCLA’s propensity to zone in which players have specific areas to cover. Expect UCLA to take things real easy on the offensive glass for this game (they crash at the second highest rate in the Pac) in order to get back and limit Arizona’s transition game. These players are unique call outs because these are the players elected to operate in isolation against Brandon Ashley and Gabe York. 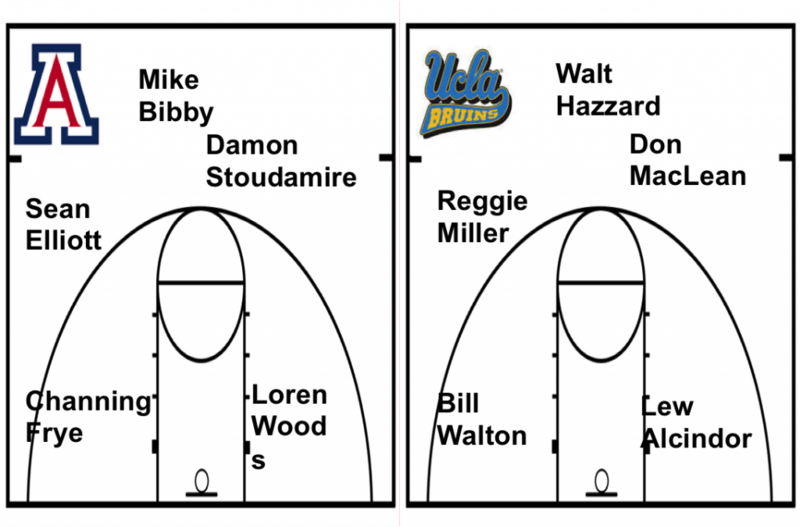 Does UCLA have anyone that could potentially fit the bill of an overpowering guard and a scoring adept forward? Yes. He attacks differently than he did a season ago but that – in the vacuum of Saturday’s rivalry game – isn’t necessarily a bad thing. “Just” 47.6% of his shots come at the rim and his foul rate has stayed consistent at about 40%. As a senior, his usage has significantly increased to 23.6% and he’s taking and making more threes. Net-net, he’s a fantastic offensive threat and a physical specimen. He’s also getting to the line more and – the part most worrisome to Wildcat fans fearful of York isos – is that of his 89 makes at the rim, just 25 (28.1%) have been assisted. Last year, that mark was much higher (47%) suggesting that Norman is more than capable of making his own magic happen. Plus, he’s done it before, scoring 15 points in last season’s Pac-12 Championship Game against the Wildcats. The primary concern for UCLA fans, when looking at the above chart, would be what appears to be a general, mid-range deficiency. He’s shooting just 28.8% from this distance and it’s a shot the Arizona defense is engineered to force him to take. The Cats force 44.5% of offense against them to the mid-range which ranks 3rd nationally. 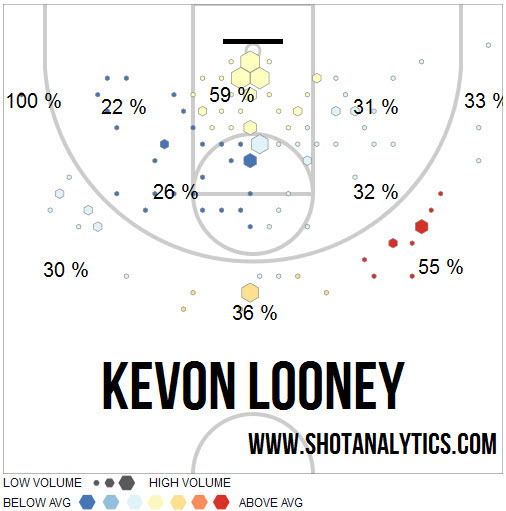 Of course if Arizona is forcing Looney jumpers then the collective defense is playing well and that’ll be an issue for all of UCLA in and of itself. Arizona has a lot of them. UCLA not so much. Once again, everyone is quick to attack Arizona’s shooting abilities. The Wildcats counter that by being even quicker to attack the basket. Why take threes when Arizona connects on the 13th best 2FG% in the nation? TJ McConnell is a mid-range monster in his own right, slicing through zone defenses built to force him to shoot. He’s shooting well and passing better. And why take threes when you can take free throws? Arizona has the 13th highest free throw rate in the nation led by Rondae Hollis-Jefferson and Stanley <3 Contact Johnson. The latter of these anti-three threats has got to be the most concerning for UCLA considering their short bench. Basically, Arizona chooses to not shoot threes for higher percentage shots. When they do fire from long range, they’re connecting at an above-NCAA-average, 35.7% 3FG%. The Bruins, however, play a defense that forces teams to shoot threes. Last year (with similar styles in play) Arizona shot 9-22 in a loss and 6-18 in a win. Meanwhile, the Wildcats are going to test that poor transition defense. If UCLA crashes the offensive glass against the nation’s top defensive rebounding team they’ll be putting themselves in a position to fail. McConnell is happy to push the pace and Parker Jackson-Cartwright is once again cleared to play, allowing the second unit to operate similarly to the first. One of basketball’s four factors is Offensive Rebounding Percentage. Arizona does a better job at stifling this factor than anyone else. 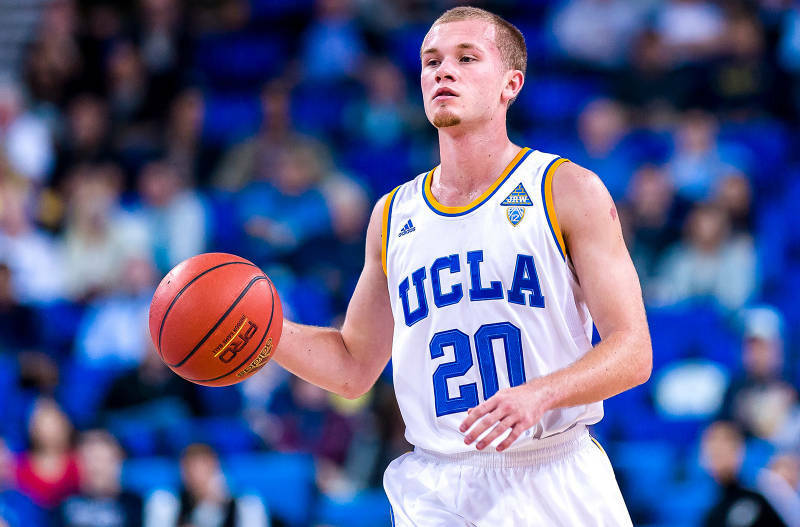 UCLA doesn’t particularly attack the rim (35% of offense there) and Alford isn’t feeding the post; they don’t shoot the mid-range ball well (215th in 2pt jumper FG%); they have a moderately fast offense but that dictates little about offensive output; they are, however, the second best offensive rebounding team in the conference (of course they’ll be facing the best defensive rebounding team in the nation so…). Zeus logs 65.1% of the game’s available minutes for a team that allows the third lowest percentage of shots at the rim in the nation. Zeus, if you didn’t know, is the Center. He averages less than a block per game and fewer rebounds per game than he did a season ago. It’d be easy to say Kaleb stinks. And many people have. Year-over-year, he hasn’t necessarily improved his turnover rate (read: BAD HANDS) or offensive efficiency (read: confidence?). But Kaleb is who is and he’s the integral part of Sean Miller’s rim protecting defense. There’s a tweet I can’t quite find from April-ish 2012 when Sean Miller wrote, “The days of 6’7″ centers is over.” He then brought in a recruiting class of Brandon Ashley, Grant Jerrett, and Kaleb Tarczewski. Maybe he’s not a walking double-double, but he knows his role on a team that features a pair of possible lottery picks and a point guard that’s managed to make Zeus look good on more than one occasion.